If you’ve handled one of Nokia’s vast array of Windows phones in the past few years twirling the Microsoft Lumia 535 round in your hands will feel instantly familiar. It’s a plastic shell, with rounded corners and anonymous black front. Slippy but able to take a few knocks, this screamingly orange device is yet another in a succession of absolutely unsubtle Lumia devices – and it’s goshdarned cheap too at £89 (around US$135, AU$164). But this isn’t a Nokia phone. Well, for all intents and purposes it is, but no mention of the Finnish brand can be found anywhere on this bargain priced smartphone. Where the old familiar logo was, the Microsoft branding now sits proudly above the 5-inch display. This is one of the first phones to come with the Microsoft Lumia branding, after the software giant completed its buyout of the phone maker earlier this year. While the Nokia name will live on with other products, notably the iPad mini-esque N1 tablet, Microsoft has started to completely remove it from all its phones. Though, nothing much has really changed. With Android and iOS dominating the high-end of the market, Windows Phone 8.1 devices tend to offer decent specs in an affordable package and the Microsoft Lumia 535 is no different. For your low outlay you will get a 5-inch display with a resolution of 960 x 540, a Qualcomm Snapdragon 200 processor, 8GB of internal memory and 1GB RAM. For the budget cost, those specs are definitely nothing to complain about. In the past few months we’ve seen some impressive budget conscious smartphones, including the Android toting Moto G (2014) and fellow Windows Phone 8.1 devices like the Nokia Lumia 630 and 530 – so does the Microsoft logo mean that Windows Phone can now neatly compete in the low-end smartphone war? Microsoft might have slapped its logo on the front and back of the phone, this is unmistakably a Nokia Lumia. The rear plastic shell pops off, revealing a removable 1,905 mAh battery and a space for a SIM card. Some regions will get the dual-SIM variant, but the UK at least will get the single SIM handset. There’s also a microSD slot here, a necessary inclusion as the 8GB of internal storage will soon run dry when you start packing in apps. The shell itself feels sturdy, but if you start to bend it the volume rocker does pop out of the shell, so… maybe don’t play about with it too much or put it in your back pocket. But even if you were to break or drop it, you could just swap the shell out for another one. Same goes if your eyes start to tire of the bright orange hue. Almost as soon as I started using the Lumia 535 I knew it was going to an absolute fingerprint magnet, and it soon proved to be a correct assumption. The plastic picks up smudges all over, oily residue sticks to it and after about an hour of use I had to wipe it clean. An hour later, another wipe down. Corning’s Gorilla Glass 3, which protects the screen, is also prone to picking up grime – so be ready, this is a high maintenance device. Aside from the volume rocker and standby switch, both of which are suitable clicky and responsive, the phone is free from other buttons. This is down to Windows Phone 8.1 following Android’s lead and allowing the use of on-screen controls. A 3.5mm headphone jack sits on the top, while the ubiquitous microUSB charging takes its place on the bottom. 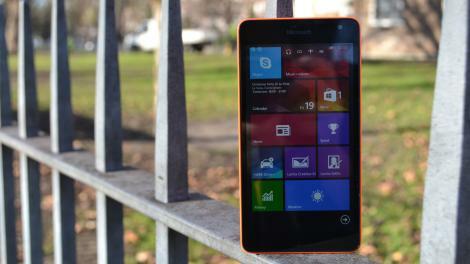 For an £89 (US$135, AU$164) device, the Lumia ticks all the boxes in terms of design. No, it doesn’t possess a premium finish like the iPhone 6 or HTC One M8, but it also doesn’t feel like a Fisher Price ‘My First Smartphone’. It’s fun, durable and well built and I’ve dropped it a few times with no damage, which is always a plus, especially when you’re clumsy tech journalist trying to avoid the wrath of angry PRs. Packing a 5-inch display into this low cost device is an impressive feat, even if the panel on the Lumia 535 is far from perfect. The 540 x 960 Gorilla Glass 3 coated display has nice colour reproduction, deep blacks and a decent hit of brightness, but it lacks detail. The blocky Windows Phone icons look fine, but text is jagged. Reading a web page is a strain and photos lack vibrancy. It’s a shame, but at this price I wasn’t expecting much better. Viewing angles are also poor. Tilt the phone even slightly to the side and all you’ll get is a faceload of reflection. I had to jack the brightness setting all the way to high, and I left it there for the entire time I had the device, just to make sure I could read the display. Auto brightness always underestimated things, turning it down too far when the lighting was less than optimal. If you’ve used Windows Phone 8.1 or WP 8 before, then you’ll feel at home here, as everything is exactly the same as on previous Microsoft-powered smartphones. After swiping up from the lock-screen you reach the main display, which is made up of tiles, all varying in size and functionality. Live Tiles can display info and act like widgets on Android, flipping over constantly to display handy tidbits. The Cortana (which I’ll cover further down) tile for example shows a news overview, while the Facebook one flips over to display any notifications you might have waiting. These tiles can be customised into three different sizes and you can add as many of them as you want. Pull down the top and Action Centre pops down, bringing with it some quick settings and an overview of your most recent notifications. Action Centre is the Windows Phone 8.1 equivalent of Notification Centre on iOS and the notification pull down on Android and while it doesn’t quite match the feature rich version in Google’s OS or the seriously updated iOS 8 one, it’s a good first attempt. First introduced in Windows Phone 8.1, Cortana is, just like Action Centre, an attempt from Microsoft to play catch-up with Apple and Google’s already established digital assistants. Named after the classic AI character from the Halo game series, Cortana is a really well-made feature that I’ve found myself using far more than I’ve done with Siri on the iPhone. You can launch it either from the homescreen icon or from the search key and once it pops into life there are a few things it can do. Tap the music note and it’ll listen out and tell you, just like Shazam, which song is playing. It was accurate too. I tested on 10 different songs, some obscure and some obvious, and it proved very accurate, delivering results in about 20 seconds. An overview of the latest news stories is accessible with a swipe up, while clicking the microphone icon lets you chat directly to Cortana. It works just like Siri; ask Cortana to set your alarm or call your Mum and she’ll oblige. Niftily though you can also type your request, which is great if you’re in an environment where you shouldn’t be having a chin wag with your phone. It’s great to see that Microsoft didn’t exclude Cortana from this phone just because it’s low-end. It performs just the same as it does on a high-end Lumia like the 1520, responding to my commands quickly and accurately, barely getting even a tricky to pronounce name wrong. The location based reminders are great too…in fact, almost too good; a reminder for me to pick up beers when I got inside Tesco worked every time. Along with including Cortana, just about every other staple feature of Windows Phone 8.1 is here too, including OneDrive, the full Office suite and Nokia’s Here Drive + maps. Office is great for quickly pulling down documents from Office 365 or OneDrive and having a brief scan through, but I never felt an urge to do any editing on the phone. This is in some part down to the keyboard, which simply takes up far too much space on the screen. Granted, it does feature some nice Swype-like flow typing tech, but the autocorrect is a pain and its accuracy is poor. One app I really appreciate is Data Sense, which tracks all your data usage whether it’s mobile or Wi-Fi. It even breaks it down app by app and you can set a limit if you only have a certain amount of data per month, either mobile or at home. A battery saver app is equally useful, showing which apps run down your juice the quickest. One constant criticism with Windows Phone has been how far it lags behind Apple, Android and to some extent Amazon when it comes to apps. While the response of ‘we now have Instagram, WhatsApp, Facebook, Twitter and so on’ will no doubt be called, for me it’s still not up to scratch. Take Instagram for example: while its true you can download it and scroll through snaps of Starbucks cups and droolworthy food just like any other phone, it’s not the same. The app feels so far behind its iOS and Android counterparts, there’s not even video support. I get the feeling that once a developer releases a Windows Phone app they feel the job is done and just leave it to pick up some downloads and for Microsoft to prove how many of the top apps they have. Yes, the apps are there, but it’s not on the same playing field as Apple and Google. I’ve always found performance on low-end Windows Phone 8 devices to be very impressive, often much better than similarly priced Android devices. While this has changed somewhat with phones like the Moto G (2014) and Moto E, which are excellent performers, I still think Windows Phone 8.1 is the best operating system for a budget device. Saying that, it hasn’t been all smooth sailing. While general performance is fine, I’ve often run into slight issues that seem a bit out of place. The Snapdragon 200 processor in the Lumia 535 makes swiping through menus and running the majority apps a mostly fluid experience, (helped by the generous 1GB of RAM), but performance on the highly graphical Asphalt 8 was a bit spotty and I had the title crash on me a number of times. More issues come from waking the phone from sleep. Often I was left with just a black screen for a few seconds before the phone came to life, then another pesky pause when I swiped up from the lock-screen. Opening directly to a game also resulted in a blank screen, with some leftover sound in the background. Screen responsiveness is also not the best here, with many taps going completely unnoticed until I jabbed my finger repeatedly on the icon. Same goes for the on-screen buttons, which suffer the same shortcomings. Using the Microsoft Lumia 535 as my main phone for a week gave me a good idea on how the battery fares, and it’s not bad. While doing all the normal things you’d expect a smartphone addict to be doing it managed to just get through to the end of the day. To paint the picture: I take it off the charger at about 8am, have three email accounts constantly pulling down data and I use it pretty solidly throughout the day with a mix of calls, video, browsing and a minute or two of gaming. After work I’d have about 40% left, with it draining down to about 10% when I plugged it in at around midnight. I’d say that’s pretty good going, though a daily recharge is always necessary. That’s only if you’re using it for general tasks; using the Lumia 535 a bit harder and you’ll see a much faster drain. Hammering a graphically intensive game, GT Racing 2 for example, slurped up the battery very quickly. A 30 minute session drained 20%, while using Here Maps to navigate to a pub about 20 minutes away took another 20%. Thankfully, I never had the phone die on me and the battery saver app I mentioned earlier is there to help if you think something is taking too much juice. That app also included a mode that conserves battery when you drop below 20%. To eke out that extra juice it shut downs functionality that isn’t especially vital, so you’ll notice a slowdown in animations, your email inboxes will check for new message less frequently and overall performance will be stunted. But, if you really need your phone to last until you get to a bar to let your mates know where you are, then I’d suggest switching on the mode when your battery is starting to drop. I found I got about an extra 45 minutes of juice with this mode turned on, so it’s definitely a nice addition, but it lacks the suite of customisation features you’d see on Android devices like the Samsung Galaxy S5. There’s no crazy super battery save mode that turns everything black and white and you can’t really to tailor it to your tastes aside from turning it on or off. I’ve grown accustomed to using 4G data for all my mobile browsing needs, but the lack of it on the Lumia 535 means I was back to 3G speeds. On 3G the device performs well, with it picking up a strong signal everywhere and calls coming through with a nice, crisp tone. You’ll also have to make do with 2.4 GHz Wi-Fi networks, as it’s not compatible with 5GHz versions, due to only being Wi-Fi 802.11 b/g/n compatible. This leads to apps and web pages taking more time to download than on a device boasting the faster AC and N Wi-Fi standards. In reality, it probably won’t be noticeable unless you’re putting it head to head with a device that packs the faster speeds, but it is important to note that if you use a router at home that splits the signals you’ll have to connect to the 2.4 GHz version. I was pleased to see that browsing the web was smooth, even when multiple tabs were loading image heavy sites slow down was minimal and the general messaging, phone and contacts apps are were solid performers as you’d hope from this budget-friendly OS. Inputting text into the messaging app is straightforward, thanks to a fairly large keyboard that had plenty of space for my fingers and keys that were well sized. The messaging app itself is personally one of my favourite text message apps on any device, thanks to its deep integration with social networks, but since the Windows Phone 8.1 update, the majority of that functionality has been killed in favour of a simpler experience. Still, the interface is pretty and its quick, but it lacks any sort of iMessage features (like chat, read notifications and efficient group chat), for those you’ll have to switch the Skype or Facebook Messenger. Again, the Phone dialler is also very basic. If you’ve come from the fantastic smart dialler in Android 4.4 then you’ll know what I mean. Once you open the app you’re met with a dialler, though typing in a name of your contact here will get you nowhere, it’s simply for making new calls. While the dialler on Android searches the web for matching numbers when you get a call, the Windows Phone 8.1 version is much closer to iOS, so you won’t get any added information unless you’ve already got the person in your phonebook. Normally, I’d sit here and mention the rear facing snapper first, leading into a nod about the front facing version. I’d do this because on 99% of smartphones out there the rear camera takes the headlines and packs more megapixels, more features and gets more use. That’s not so on the Microsoft Lumia 535, as both the front and back shooters boast 5MP sensors and many ways the front-facing one is more interesting. Jumping on the selfie bandwagon, Microsoft has added a special Lumia Selfie app, which is all about getting the most from your portrait snaps. The app lets you take a shot and then add numerous filters, enlarge your eyes (why?) and even make yourself look slimmer. Though all this did was make me look rather skeletal and ill. The ‘selfie’ camera also has a wider angle lens so you can cram more folks in, which is actually quite a useful addition if you want to spread the narcissism. There’s also the Lumia Camera, a separate app that lets you use both cameras, take video and alter all the settings from white balance to ISO. It’s nice to have these options, but with a camera of middling resolution, it’s overkill. Altering the settings doesn’t really leave you with better pictures, just far worse ones. I’m also a bit confused as to why there needs to be two separate camera apps. Just bundle all those selfie features into the main app and be done with it. Snapping a shot was quick though, despite autofocus often being a little hard to pin down. Pictures themselves were about what you’d expect from a budget phone, probably Instagram-worthy if you’re in good light, but nothing that’ll make you want to do away with a proper point and shoot. Contrast and detail were both severely lacking, while it always looked like my snaps were taken on a miserable day, even when there is plenty of sun out. Selfies were better, but I couldn’t really notice those extra megapixels over competing devices. Video was poor and limited to 480p recording at 30fps; most cheap tablets can do better than that. It stuttered and looked like I was purposely shaking the phone, which I wasn’t. Living with a Windows Phone 8.1 device is both an enjoyable and frustrating experience, whether that device is a high flying flagship or, like the Microsoft Lumia 535, a £89 (around US$135, AU$164) entry level model. Certain things about it I really love, from the tiled interface with those tidbits of useful info flipping into view to the fantastic digital assistant Cortana. I also really appreciate how Microsoft has not diluted the software experience here, even though it’s a cheaper handset. You get full Office access, full Cortana support and because it packs 1GB of RAM, you won’t run into games incompatibility like you would if it was only boasting 512MB. While it’s far from premium, the fun, durable and sturdy build, along with the removable back and bright colours combine to make something that is perfect as an entry level smartphone. Having a wide-angle front facing camera makes a great amount of sense, whether it’s for selfies or Skype chats. It stops everyone feeling like they have all squeezed in and ensures you don’t accidentally miss someone out of the picture. Performance on the whole is good, but I did suffer frequent annoyances that refused to go away. Screen sensitivity issues plagued my time with the device and I hate nothing more than jabbing away at an icon multiple times before it responds. Even though apps like WhatsApp and games like Minecraft are available on the Windows Store, it annoys me how developers release an app and then let it lay dormant with any updates and new features. As mentioned, the Instagram app still doesn’t support video, which simply isn’t good enough. While the screen is perfectly acceptable for a phone of this price and having 5-inch display is obviously a plus point for some, I just think it stretches an already low resolution too far. I didn’t enjoy reading or viewing pictures on the screen and the lack vibrancy made everything look a bit dull. The Microsoft Lumia 535 has a good build, packs a large screen that, while it hasn’t got the highest resolution, produces good colours and operates for the most part with ease, plus you get the full Windows Phone 8.1 experience. But to achieve the low point, sacrifices have to be made. There’s no NFC for example, no faster AC/N Wi-Fi and no 4G. These points could be forgiven, but the screen issues I suffered with the Lumia 535 are not easy to overlook. Yes, they could (maybe) be eradicated with a simple software update, that is if the issue aren’t hardware related, but only time will tell if that ever happens. Grievances aside, there’s lots to like here. The wide-angle 5MP selfie shooter captures decent pics, Cortana is a fantastic virtual assistant that is just as fully featured here as in top of the line Windows Phone 8.1 devices and the replaceable, colourful shells add a dash of fun.